When I ask people if they know what the word namaste means, most know this as the closing blessing of a yoga class. And while this is generally true, that’s not the most important thing to know about the word, nor does it give you true indication of what the meaning is, or why someone might say it to you. There are many different ways I have seen namaste defined, but most commonly and simply, it means: “The divine light in me honors the divine light in you.” It is an acknowledgment of respect for another and their unique energy and presence. You might have seen people use it as a gesture of thanks, welcome or gratitude, paired with joining both hands over the heart, palms together, with fingers pointed to the sky. For whatever reason, I have always found it to be a very graceful, peaceful way for two people to acknowledge each other, whether as equals or as teacher and student. Five years ago, I didn’t know what the word meant. I hadn’t had people in my life that regularly used this acknowledgement of another, and I really thought it was just something that yoga teachers and students said. So when I learned the true meaning, I was quite taken with it. But interestingly, at nearly the same time, I had someone tell me that namaste was a word that you had to “earn” the right to say…..that you had to have achieved a certain level of spiritual mastery to be able to say it or to sign an e-mail with it. I found this completely baffling, and contrary to what I understood the meaning to be in the first place! While I knew namaste to be an acknowledgement of another that is free of ego, this seemed to be an opinion that was full of ego and elitism! So I made it a personal mission to make sure that I really understood what this word meant, to me and to other people. What became clear to me was that for the majority of people, they really felt the connection to the energy of honoring another person….to acknowledge that they “see” them and meet them as an equal divine being. Beautiful. But I soon realized that it wasn’t that part of this word that I connected to, but instead, the honoring of the divine light in myself. It has always been easy for me to see the divine in others. I see the beauty and talents that others have that awe and move me, so saying namaste to another had always been about that for me. I ultimately realized that the real gift was for me to see and honor the divine in ME. I am just like so many of us who see our own flaws first, and don’t see the divinity in every detail of who we are. So acknowledging the divine in myself was more challenging. But I am working on it, and see the perfection and value in the honoring of all aspects of Self, and striving to see that divinity every day. In January of 2014, I “saw” a tatoo of the word namaste in my third eye and realized that I wanted to have a reminder of it in the form of a tatoo. And when my daughter called me less than a week later to tell me she was thinking about getting a tatoo, I knew that it was time. 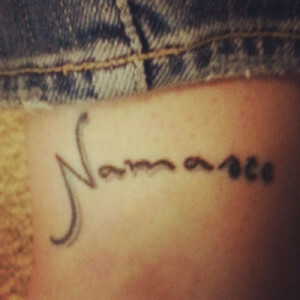 With a bit of nervous trepidation, I got my Namaste tatoo on the inside of my ankle and I love it. After so much reflection on the word Namaste, it has special meaning to me and my tatooo reminds me each day to honor the divinity in myself. Next post: Why the Cover Photo?